Popular Woodworking magazine put up my new post: The Complete Guide to Building the Blacker Entry Mirror today. Here’s a link to the post. The guide is a 54-page version of my article that appeared in the June 2018 print issue. If you’re going to build a Blacker Mirror, this new free Ebook version will really help. You can download it and the extras from Popular Woodworking, or if you just can’t wait just click here. Let me know if you build one and send me a pic. Digital woodworking tools are a challenging, sometimes frustrating and always a lot of fun to work with. But, it’s easy to be distracted by cool high tech hardware, computers, CNCs, laser cutters, digital routers and miss the most important tool of them all: CAD design software. Without it, you won’t get very far. But with it, it’ll take you and what you want to make as far as your imagination will go. If you take the time to learn how to use it. There’s no question about it. If you want to make cool stuff in digital woodworking, you’ve got to design it first. And, CAD is the place you do it. Good CAD software is worth far more than whatever it costs. Actual price is not measured in dollars. It’s about the vast quantities of time you’ll spend learning it, using it and pushing it to the limits of your skills and imagination. Pro tip: don’t be cheap. Get the one that can take you where you want to go not just today, but tomorrow, too. Think of CAD as an investment in your future. It’s the place you’ll be living in for a long time. Might as well make it enjoyable and productive. Divide the upfront cost over the many years you’ll use it and you’ll discover it’s a bargain. Invest wisely. I confess. I sometimes have a problem with self-induced volunteerism. Throughout my adult life, I’ve been consumed many times by a project, cause or group in need of something I could contribute. One of my latest adventures was to design and build 9 workbenches for a community woodworking group. Good folks. Happy to help. But, like a lot of things, I’ve taken it way over the top. So, besides a new bench design each one got their own unique vise chop. Designed in Rhino3D, programmed in RhinoCAM and machined on my CNCs. 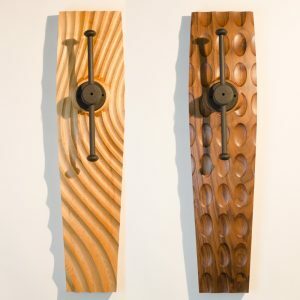 I’ve been writing about this project over several blog posts at Popular Woodworking’s online site. Here’s a link if you missed it. And, here’s a link to photos of the vise chops.